From a drawing to a gouache and the actual realization of the final piece with the selection of gemstones, their cutting, setting, and polishing, the birth of an haute joaillerie piece is a succession of precise steps, each executed by different craftsmen. Their know-how, passed down through the generations, remains lesser known, often surrounded with secrecy because of the value attached to their work. Working with precious metals, the jeweler, for example, is responsible for the structure of the overall piece, while the setter will mount the stones, ensuring their stability, and the polisher will buff all the surfaces holding the jewel. Spreading the appreciation of these skills as well as a general understanding of gemstones is the mission of L’École de Van Cleef & Arpels, which was set up nearly two years ago. Neither a professional school nor a gemological school, it is truly unique in its teaching approach offering a series of 15 courses, many with hands-on experience, which seek to present sometimes complex techniques in a very accessible way to the layman. “This school is open to all. 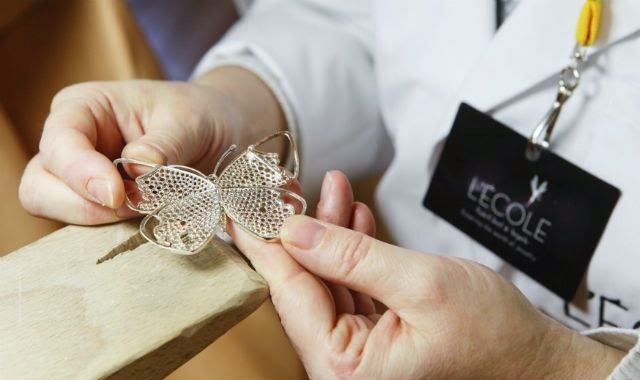 The classes have been envisioned as an initiation into the world of fine jewelry, which is often a secretive world, when it shouldn’t be,” explains Marie Vallanet-Delhom, president of L’École de Van Cleef & Arpels. Here you will learn to observe stones, honing your eye to their color and clarity, use a jeweler’s monocular loupe to search for imperfections in a stone, or manipulate different types of diamonds to understand the famous four Cs (color, cut, clarity, and carat weight), though the jewelry house also refers to a fifth C, for character. “This is a place to experience how the gestures are passed on and to understand the savoir faire involved in the work,” says Vallanet-Delhom. The 15 four-hour courses have been organized around three main pillars: the history of the art of jewelry, with more theoretical courses for example on the symbolism of jewelry, the history of talismanic jewelry or a look at highly creative periods such as the Art Nouveau; the world of gemstones, with courses on recognizing stones or learning about diamonds, and the more hands-on savoir faire, with classes showcasing the jeweler’s gestures. Vallanet-Delhom says over the last 18 months very small adjustments have been made to the course and some new classes have been added, in particular one on Art Nouveau and two on watchmaking, one looking at the measure of time through history and the other more technical in its approach. “These classes in watchmaking are really meant as an initiation, not a class for a specialist. It is really for a neophyte who is interested in learning more,” explains Frédéric Gilbert-Zinck, deputy director of the school. While the school started in the salons of an 18th-century townhouse on the Place Vendôme, a stone’s throw from Van Cleef & Arpels’ atelier and boutique, it has now moved to a permanent space of 750 sq m nearby – concrete proof of the demand for its courses. In two years, more than 2,200 students have taken classes, and the school has also recently started to expand its offerings, reaching out to corporates for example to offer team building courses. Many of the classes are taught by Van Cleef’s artisans. L’École spreads its wings once a year travelling internationally and after Tokyo last year, it will take up residence for two weeks this October in Hong Kong’s new center for culture and creativity, PMQ, offering a selected range of inspiring courses. “From the start, the school was always envisioned as a nomadic one. We take the most representative classes and we change the format slightly because of the simultaneous translation. So in Hong Kong we will have English and Chinese. Next year, the school will go to New York,” explains Gilbert-Zinck. The two-week program will be held from October 16 to November 1.